You are convinced of the advantages of cloud computing, such as increased business agility, flexible capacity, pay-per-use and quick access to new technology. But which option is best for your organisation? And how do you make a successful transition to the cloud? What exactly is ‘the cloud’? On this page we tell you more about the cloud, how it works, the differences between private, public and hybrid clouds and how you prepare your organisation for a successful transition. At what moment the cloud was created exactly is difficult to say. Nor do we know who coined the term. Fortunately, we all mean the same now when we talk about the cloud. Wikipedia states the following: Cloud computing is a kind of Internet-based computing that provides shared processing resources and data to computers and other devices on demand. The developments of the cloud go in a particularly rapid pace. Around the year 2000 it was Salesforce which, by being one of the first companies to offer a software solution that was purely available online, created a major breakthrough in Software-as-a-Service (SaaS) services. Meanwhile, the SaaS market is growing five times faster than the conventional software market (source IDC). See for example, Office 365, where the office software doesn’t need to be installed on the computer anymore. With Platform-as-a-Service (PaaS) services developers can immediately start to build and deploy their SaaS services. Installations are becoming increasingly easier enabling a faster time to market to be realised. All this is impossible without infrastructure: the processor power, memory, storage and connectivity. With an Infrastructure-as-a-Service (IaaS) solution the preconditions to develop further services are created. Thanks to virtualisation techniques, servers can be created from behind the desk from a large pool of the aforementioned resources and be activated with a single click. When you discover that the advantages the cloud has to offer also apply to your organisation, it’s time to determine what steps need to be taken. The way to the cloud can be unclear and raise questions. What is the best way to transition to the cloud? For which part do I choose the private or public cloud, or maybe a hybrid solution is best? Are all of the risks identified? And what about the guarantees, security and compliance? With the Cloudscan of Internedservices you know what the cloud opportunities are for your organisation. Our cloud specialist will walk you through a series of questions to determine the possibilities (opportunities) and limitations of the cloud for your organisation. After this session, we will give you specific advice and you’re ready for the next step. In case of a private cloud or cloud environment, the infrastructure is provided for one specific organisation. Management or support can be done by your own IT organisation or be outsourced to a service provider. The infrastructure may be located in your own server space or in the datacenter of a provider. Just like you, we think the performance, management and security of your e-business is important. That’s why we developed Managed Hybrid Cloud. This platform allows your IT to grow flexibly with your business and increases the manageability of your IT costs. 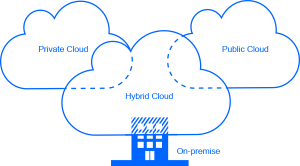 The Managed Hybrid Cloud platform is ideally suited for hybrid cloud solutions. For example, we can ensure that specific data is only stored in the Netherlands and thus complies with Dutch law. Infinite scalability of your platform, where your supplier is responsible for the maintenance of the infrastructure. That is the public cloud. And you only pay for what you use, with the advantage that you don’t need to buy and write off own hardware. The apps on your phone or tablet are served from the public cloud. For example, users in China or America can use the service and enjoy the same performance, with the global availability of a public cloud. Being the first Microsoft Cloud Solutions Provider in the Netherlands we have a lot of experience with solutions in the public cloud. Allowing us to offer solutions for the most diverse challenges. So you don’t need to worry about your platform and can enjoy the benefits of a specialised partner. The hybrid cloud brings together all the benefits that the public and private cloud offer. Thus creating the possibility for your applications and workloads to run where they perform best. Sensitive information or specific systems can be hosted in a private cloud and offered only internally in your organisation. At the same time other solutions that have to be served (worldwide) quickly, are using the public cloud. With a hybrid cloud solution these environments can be connected so that communication and data exchange is possible. For each application, we look at the various indicators such as scalability, performance, redundancy and security. Depending on the outcome, we choose the right cloud form. It is advisable to get a specialist involved at an early stage in your research. This way you ensure that the transition to the cloud is successful and you are taken to the best that IT has to offer. Curious as to the possibilities for your organisation? Contact one of our specialists now. Did you get excited about this case and are you curious how we can realise this for your organisation? Call us at +31(0)88-4803000 or complete the form below and we will contact you.